Scope and Content Glenfarclas Distillery, Ballindalloch, Banffshire This distillery was founded in 1836 by a farmer, Robert Hay. It was eventually acquired by the Grant family, who formed a limited company with Pattison Elder and Co in 1895, which rebuilt it. Pattisons collapsed in 1898, and the Grants again took over. This view shows the old mash tun, supplanted by a Lauter tun, but still in good condition. It is typical of practice in the industry in the early 1970s, with a cast iron tankand copper cover for heat economy. 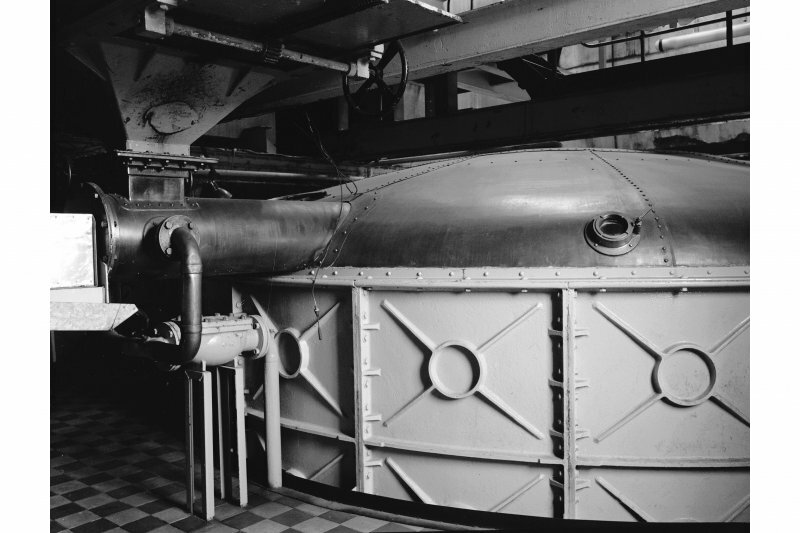 This mash tun was probably installed when the number of stills was increased from two to four in 1960, and supplanted when two more were added in 1976. To the left in this view is the mashing machine, in which crushed malt is mixed with water. Source: RCAHMS contribution to SCRAN.